Ebook is an abbreviation of electronic book. An ebook is an electronic file that can be downloaded for reading straight from your computer, tablet or smartphone. It allows you to search the content and easily navigate through the book. In Easy Steps ebooks are supplied in a format called PDF – Portable Document Format (see below for restrictions). 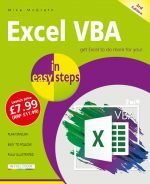 What do you need to read an In Easy Steps ebook? A PC, a tablet computer or a smartphone with Windows, macOS/Mac OS X, iOS, Android* or Linux. *Some Android devices are unable to read password-protected PDFs. If you have any problems please email us and we will respond within UK working hours (9am until 5pm). When you purchase an ebook, you’ll be sent a link to download the book. Once you have received this code you must download your copy within 30 days. Further instructions on viewing your ebook on your different devices will be given on purchase. In Easy Steps ebooks are copyright protected and are therefore password protected. We will provide your password in your e-receipt, and the password will be needed to access the ebook PDF. Ebooks are not returnable and will not be refunded, but you can test the sample pages provided on each book’s product page first, to ensure that PDFs work on your device. The product is intended only for use by the purchaser. All rights reserved. No part of our books/digital books may be reproduced or transmitted in any form or by any means, electronic or mechanical, including photocopying, recording, file sharing or by any information storage or retrieval system, without prior written permission from the publisher. Text cannot be edited, copied or highlighted in In Easy Steps ebook PDFs, and they cannot be printed. Because of the large number of screenshots and photographs used in our books, image descriptions are not provided for our ebook PDFs. Most of our ebook PDFs are plain PDFs with no hyperlinks for contents, headings etc, but they can be searched for words or phrases in Adobe Reader. These features are provided, as is standard with Adobe Reader. Text cannot be edited, copied or highlighted in In Easy Steps ebook PDFs, and they cannot be printed. Accessibility options such as background and text colour can be changed in Adobe Reader. For further advice and help with Accessibility for In Easy Steps ebooks, please contact us.